Children's literature, family math and science books, and homeschool materials. There are more high quality books available than we’re able to offer directly. To see additional recommendations, please see our list of recommended math books on Amazon.com. by Aileen Friedman, illustrated by Kim Howard. When a tailor sets his 3 children to the task of designing and stitching a cloak, the third son makes a cloak of circles, creating the dilemma in the story. Children are delighted at the solution. A great tool for exploring tessellations and other geometric principles. Joe wants to march in the parade but every time the lines are uneven, he must stand aside. Determined to solve the problem, Joe rearranges the bugs in his squadron until inspiration and fortitude result in five lines of five -- and Joe fits in at last. 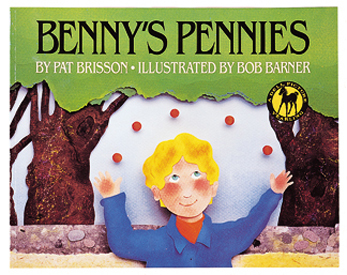 Benny McBride starts his day with five new pennies and is determined to spend them all. With the help of generous and thoughtful neighbors, Benny arrives home loaded with five simple but splendid gifts. 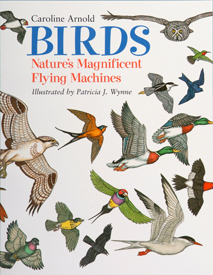 This book looks at how feathers, body structure, and wings vary from bird to bird. Readers will learn the mechanics of bird flight from takeoff to landing and discover how wing types meet the survival needs of each species. An informative introduction to the "world records" held by fourteen members of the animal kingdom. Each spread portrays an animal that is the largest, slowest, longest lived. Readers can see the animal's size in relation to something familiar. First, learn to use simple addition to find the total number of dots, from zero to twelve, on each domino. Then, see if you can find the dominoes with each total hidden in the pictures. 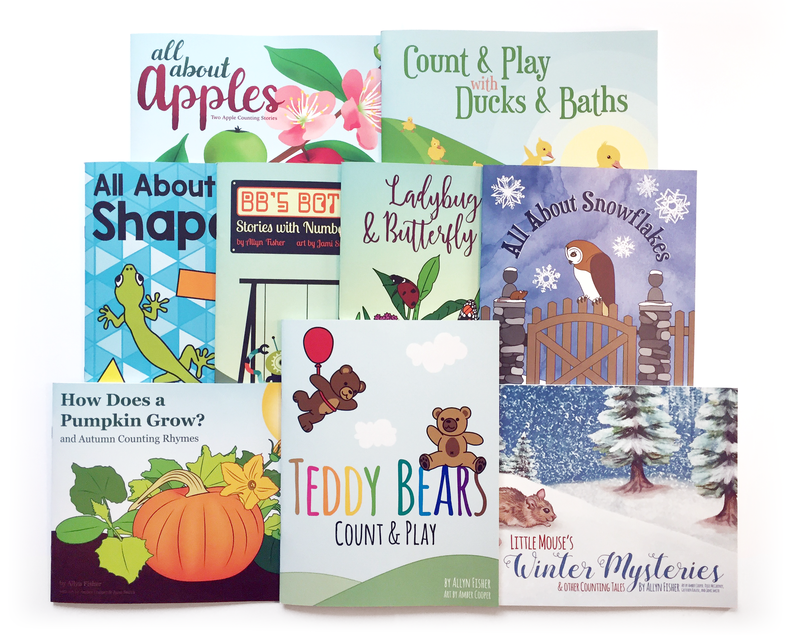 With a simple but imaginative approach, Lynette Long has created a fun-filled counting book sure to appeal to even the most reluctant math students. Full color. In early American times, almost every house had a patchwork quilt, sewn together from hundreds of pieces of fabric. Each quilt was unique, with different combinations of fabrics and colors and a distinct pattern. But who developed these patterns? And what did they mean? 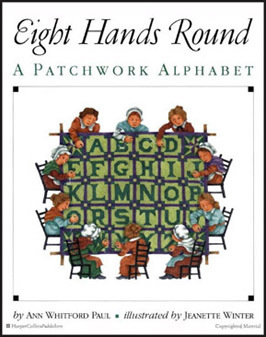 The author's fascinating text describes many of the different quilt patterns, placing each in historical context. From the Anvil to the Zigzag, this is a creative look at a meaningful folk art tradition and an important period in American history. 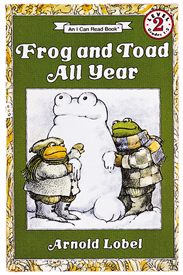 In winter, spring, summer, and fall, Frog and Toad are always together. Here is a wise and wonderful story for each season of the year. Climb the tallest mountain, dive into the deepest lake, and navigate the longest river in Steve Jenkins' stunning book that explores the wonders of the natural world. Describes some of the remarkable places on earth, including the hottest, coldest, windiest, snowiest, highest, and deepest. Discover what you could do if you had the amazing abilities of a frog, an ant, and more. 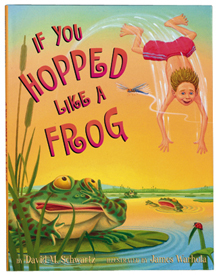 This entertaining book includes a weight ratio comparison appendix with colorful illustrations. As children learn about large numbers, counting becomes less practical and understanding these numbers becomes more and more important. In this playful and mathematically sound book, children will develop an understanding of how big, how small, how long and how tall 1,000 really is. Jim woke up early one morning to find a plant that was very like a beanstalk growing outside his window. Climbing to the top of the beanstalk, he found a castle and a giant, but with very modern problems that only Jim could help solve. Learn about bridge construction from the earliest footbridges to towering suspension bridges. Includes full color photographs and in depth descriptions of bridges from around the world. June 2004, Volume 14, Issue 6. Learn how wedges, wheels, pulleys and levers operate. Kids encounter the first simple machine: the wedge, which turned up as chisels, axes and arrowheads some 2.6 million years ago. Then it's on to levers, which are found in everything from scissors to baseball bats, and the wheel, without which we would not have cars. An enterprising ant suggests different formations for 100 ants to travel in rows to get to a picnic faster. 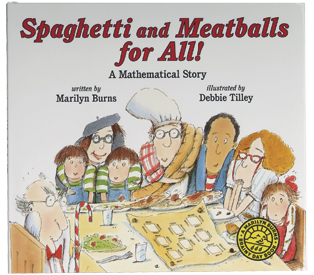 This simple story told in verse is an excellent way to introduce factors of 100 and to spin off entertaining mathematical activities. To earn his knighthood, Radius must find and rescue a missing king. Sir Cumference, and his mother Lady Di of Ameter, give him a circular medalion (a protractor) that he uses to find his way through a maze of many angles. From one one-ton whale with one strong tail to ten squirmy squids squirting ten inky trails, colorful sea creatures lead children from simple counting to squaring numbers. 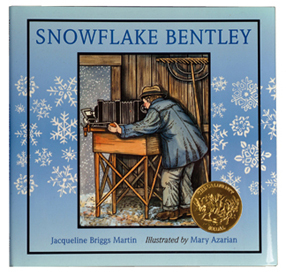 Children will love this engaging true story of Wilson Bentley and his fascination with snowflakes. Equipped with a camera and microscope attachment, Bentley reveals two important truths about snowflakes: no two are alike, and each one is astonishingly beautiful. Paperback. Mr. and Mrs. Comfort are having a family reunion. Mr. Comfort starts cooking up his famous spaghetti and meatballs, while Mrs. Comfort carefully arranges eight tables and 32 chairs so that everyone will have a seat... but the guests arrive with their own seating plans. 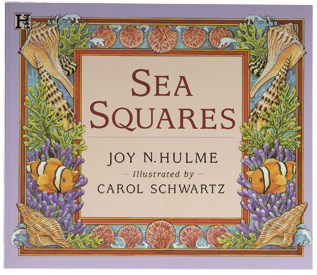 This book uses wit and humor to draw children into thinking about area and perimeter. An Indian potentate receives a service from a wiseman and insists on repaying the favor. 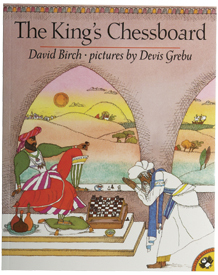 The wiseman requests the familiar mathematical puzzle of the chessboard, on whose first square is placed a single grain of rice, on whose second square is placed two grains, four on the third square, and so on. The king, who is too proud to admit that he can't calculate the sum total of the gift, foolishly grants the wish, at least until it becomes clear that it will wipe out his stock. A newly illustrated rendition of the classic tale of Emery Raccoon who invites 328 friends to lunch. Emery quickly discovers his greatest friend isn’t one of the invited guests.